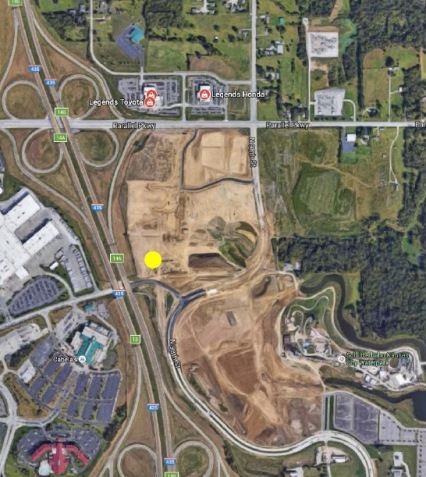 New developments near I-435 and Parallel Parkway approved at UG meeting – Welcome to Wyandotte Daily! More developments, including a hotel, retail shops and a Frontier Justice gun range, are coming to the area east of The Legends Outlets in Kansas City, Kan.
Now that the auto mall area along Parallel Parkway is nearly completed, Schlitterbahn is shifting its focus to developing the east side of 98th Street next to the soccer complex, and the 50 acres that front on the east side of I-435, according to UG planning documents. Some new developments were approved near I-435 and Parallel Parkway by the Unified Government Commission at tonight’s UG meeting. A Schlitterbahn development group, SVV 1, LLC, received rezoning approval tonight for a development south of Parallel Parkway and east of 98th Street. The location is on the southeast corner of Parallel and 98th. A hotel and retail businesses are planned for the development, according to UG documents. There are 72.68 acres, currently mostly agricultural land, to be platted in the development. To the west and north are some new car dealerships, according to the UG documents, with some houses to the east and north. The U.S. Soccer Training center is to the east. According to the project application, the county and other taxing units would receive more revenue in property taxes and sales taxes when the property is developed than the property would generate as unused land. The UG Commission unanimously passed this zoning change without discussing it tonight. The commission also approved a special use permit and plan review application for Frontier Justice Retail Center, 1700 N. 100th Terrace. The development will be a 33,282-square-foot retail location with firearms training facility and an indoor shooting range. Brin Brown, owner of Frontier Justice, with her husband Mike Brown, Lees Summit, Mo., said she and her husband started the next-generation firearms facility, which is an entertainment center and retail destination with a firearms component. There is one in Lees Summit. She said they emphasize faith, family and freedom as their core values. Ten percent of the company is owned by the National Christian Foundation for the community’s good, she said. The center includes an indoor shooting range, boutique and café, she said. The building includes a tilt-up concrete panel for sound control and for security, Matt Masilionis, RMTA Architects, said. The building uses steel, wood and masonry and has a frontier feel to it, he said. It will fit well with the auto dealership building to the north of it, and the Frontier Justice building will have a tnemec coating, he said. 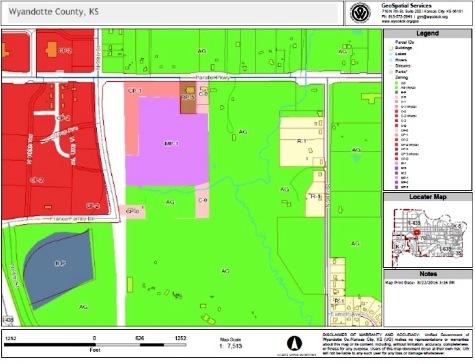 Richard Napper, Kansas City, Mo., supported the project on behalf of EPR Properties and SVC 1 LLC, the master plan developer for the 350 acres. About three years ago, a team was assembled to jump-start the development of the 350 acres, he said. He said a year ago, they engaged in a conversation to bring Frontier Justice here, and they had to compete with states to the south to land the project. The commission passed the project, 7-0, with no commission discussion. The commission also approved a change of zone to planned commercial district for an auto body repair shop, car wash for the body shop, Legends Honda and convenience store at 10000 Lafayette Ave. It is on the north side of Parallel Parkway, where existing car dealerships are located. Part of the space will be for an overflow parking lot for Honda employees and excess cars, according to a representative of the developer. The car wash will not be for the public. The auto body shop project with approved 8-0, with Mayor Pro Tem Melissa Bynum voting yes. In other action, the UG Commission sent back to the Planning Commission a vacation of utility easement application at 3742 N. 112th Court, in a project to build a few new houses. Neighbors appeared at the meeting to say that there was water in their backyards when it rains, and they were concerned it would get worse with a building project. The planning commission will analyze additional information regarding drainage easement and make a new recommendation. The UG Commission also approved a preliminary plan review for a small hospital facility at 10544 Parallel Parkway. The applicant was listed as TH-Kansas City, KC-1-UT, LLC of Georgetown, Texas. The facility on Parallel would include eight inpatient beds, an emergency room, imaging suite and small warming kitchen, according to planning documents. At the Planning Commission meeting earlier, the applicant declined to disclose whether it was affiliated with any hospital. Would love a Planet Fitness! A Golf retailer would do well in this area, just saying. Office Supply and Craft store would sure be a good fit. I think this has been voiced several times before, but here it is again. Please. Somebody put in a craft store like Michaels or Joannes. A Dillon’s would be even nicer than Aldi for a full service grocery store. Hen House was supposed to build at 110th & Parallel at one time. A Dillon’s would be a good competition for Hen House & Price Chopper prices. As Glenda Baker said, we need a fabric, craft, hobby store like Joann’s. It would be a welcome boost to the Legends area. Walmart fabric selection isn’t good enough & other Walmart stores have markdown fabric like remnants, etc. Home Depot and academy sports please! The area is in need of a few daycares. There has been lot of new homes, apartments and business, leading to a shortage of good child care. Can you please put a Popeye’s Chicken and Dairy Queen. Need a Chuckie Cheese,indoor outdoor pool and golf course and go cart place. Some place nice to take my kids to have fun in Wyandotte County. Pizza Ranch, Sky Zone, Power Play. Ok,how appropriate to have a new medical facility close to a Frontier Justice. Seems so convenient. to the St Luke Community Hospital at 10544 Parallel Kansas C. Kansas. Resume upon request, and were to send a application of employment. It would be nice if they built an Aldi’s close to the Legends Mall Area? Wouldn’t have to go to Leavenworth, Shawnee or even down into K.C.KS around 48th Street I think. FYI, There is an Aldi in the plans in the lot west of theJC Penney/Target building. Yes Plaza Speedway Shops and Waterside development still have Inline Spaces and Pad Sites available. Winco or Sprouts or Lucky’s Market or Ramey Price Cutter or Albertsons. Sierra Trading Post, Field and Stream. Del Taco, Andy’s, Black Bear Diner, Mad Green’s, Pizza Ranch try again, Capriotti’s and so on.